Panjim, February 28: The Hon’ble Minister for Tourism & Sports, Mr. Manohar Ajgaonkar today impressed on the need for greater participation of swimmers and young Goans in open water swimming competitions, while felicitating winners of Swimmathon 2018 at Colva beach here on Sunday. 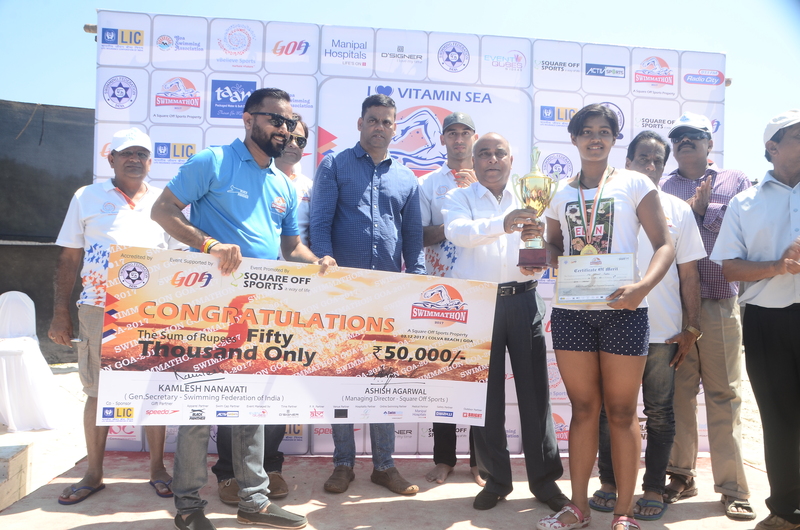 In its sixth edition, Swimmathon – India’s Premier Open Water Swimming Championship, witnessed an audience of over 700 participants being cheered on with their coaches, friends and family members at the popular Colva Beach in South Goa. The event was graced by the presence of Mr. Manohar Ajgaonkar, Hon’ble Minister of Tourism and Sports, Government of Goa as the Chief Guest of the event, who gave away the top prizes to the well-deserved winners. Organized by Square off Sports in association with Goa Tourism and Swimming Federation of India, Mr. Ajgaonkar urged the organizers to start training camps in Goa for Goans as their CSR activity. Mr. Ajgaonkar further said that the Department of Sports and Youth Affairs, Govt. of Goa is working hard for the overall development of Sports and is in the process of creating world class sports infrastructure. He further added that Goa has received recognition and laurels for successful organization of Lusofonia Games, FIFA U17 World Cup and is gearing up for the National Games 2018. Swimmathon brand ambassador, 2014 Asian Games Bronze medalist and Arjuna Awardee – Virdhawal Khade, Indian National Swimming Coach and Dronacharya Award recipient – Pradeep Kumar along with Kamlesh Nanavati, General Secretary, Swimming Federation of India, Ashish Agarwal – Managing Director, Square Off Sports along with other dignitaries were also present on the dais. events including Asian Games in 2018. The complete list of winners will be available on the event website, swimmathon.squareoffsports.com.